I never used to wear lipstick at all - I'd avoid it at all costs thinking that the slightest bit of colour would draw attention to myself. A few years ago though I started buying MAC lipsticks and began experimenting with brighter bolder colours, understanding how the right shade can finish off your look perfectly. I started off buying MAC and 'drugstore' brands from Boots and then a few months ago I splashed out on my first Chanel lipstick - Chanel Rouge Coco in shade 56 Teheran. The shade 'Teheran' falls into the Rouge Coco category and is a lovely shimmery coral with just a little hint of pastel pink. I think I must have swatched close to the entire range before I decided to buy this one. 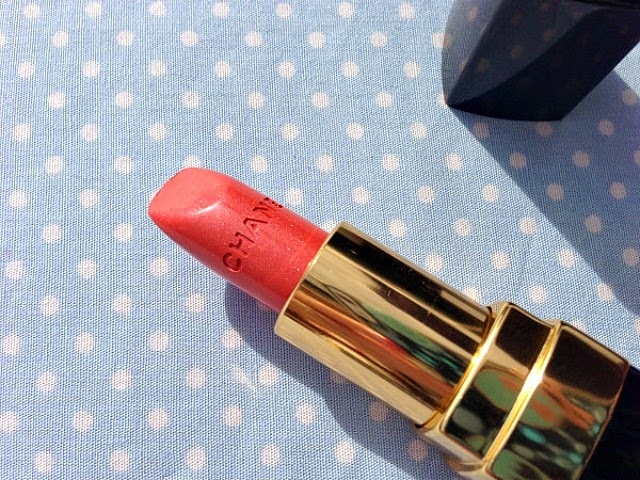 I love coral lipsticks - not only do they look great in the summer with a tan, I think they are wearable all year round. I love my MAC Vegas Volt Lipstick which is a bold intense coral, but this is a beautiful shimmery, more subtle shade. The Rouge Coco formula is a hydrating creme satin lipstick that delivers an even and smooth colour with just one application. 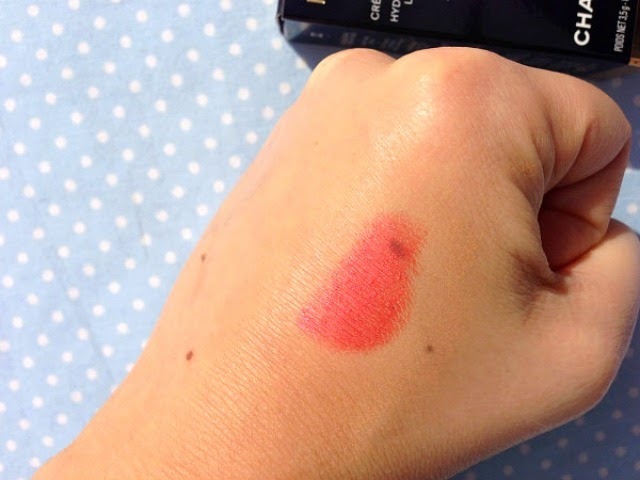 It is highly pigmented (more than I imagined it would be for a lipstick that feels so lightweight to wear) and gives an opaque coverage to the lips. It isn't particularly creamy, but it certainly doesn't leave my lips feeling dry at all. Out of all my lipsticks I think this is the most comfortable one to wear. As usual when I apply lipstick, I apply then blot then apply and blot again and this gives me hours of wear without needing to top up. I can eat and drink and this lipstick does not budge at all! (Always a bonus when you've splashed out extra pennies for a high end lipstick!) I also love the shiny black and gold packaging which is sleek and sophisticated and a nice addition to any makeup bag. 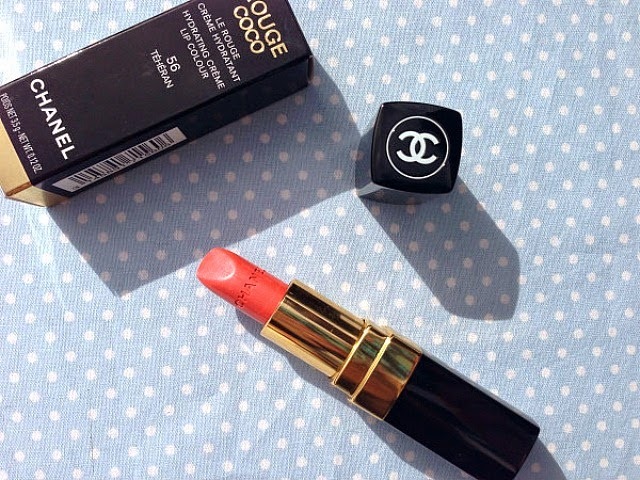 I purchased this Chanel Rouge Coco Lipstick from Boots for £25 which is on the more pricey side, but this is a high end brand and is worth every penny in my opinion. I'm already thinking about which shade in this range to purchase next, so if you have any recommendations please leave them in the comments below. (I also bought a Chanel Joues Contraste Blusher at the same time which you can read about here). Do you have any Chanel lipsticks? What's your favourite shade? What a gorgeous colour :) I have MAC's Lady Danger which is a coraly red, which I love but I still don't wear much- I'm not used to wearing the bolder colours yet! I've tried Lady Danger as I think it looks gorgeous on some other bloggers I know, but it just looked bright orange on me.....I didn't suit it at all! Boots points are great aren't they! This is such a pretty colour ! I would LOVE a Chanel lipstick they look so pretty ! Ooh that is so pretty. Do you know what, I don't think I own a Chanel lippy. How bad is that!! My 1 Year Blog Birthday and 100th Post!